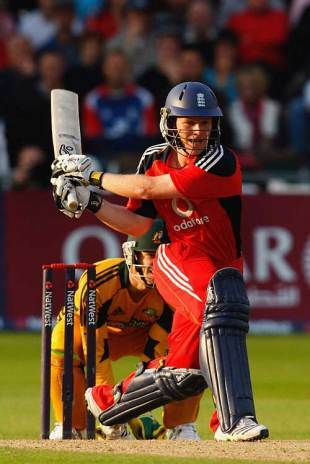 Eoin Morgan believes he is still some way short of the finished article despite selling for US$220,000 to Royal Challengers Bangalore at the IPL auction on Tuesday. Morgan was the only England player to be awarded a new IPL contract, and he is now set for a handsome boost to his finances. "When the bid came through I was delighted," Morgan told Cricinfo. "I was very nervous beforehand. I made a deal with my housemate that he would watch it and I would try and sleep through, but inevitably I woke up 10 minutes before I was due. Though I didn't want to watch it, I ended up following it on Cricinfo." His nerves only heightened when Shahid Afridi failed to attract any interest. "After seeing him not get a gig, I thought I would struggle, but once it came up that Bangalore had bid for me, I knew I was sorted." Read the rest of here.